The day of the Darwin mistletoe workshop (see blog 13th Feb) . So off to north Kent/south London first thing. We start off with my mistletoe briefing – in Down House. Which is nice – ‘cos we’re in one of Darwin’s own rooms… So I feel obliged to quote, at appropriate moments, from Origin of Species. 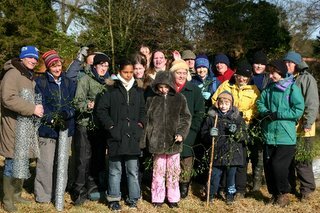 Then it’s off to plant some mistletoe, pausing only for the obligatory press pics. Plus it’s a b****dy cold day (there’s snow in the lane), which accounts for why these lovely ladies are all sporting cosy hats. Then a quick bit of planting on some limes on the Sand Walk… before a light lunch at the Down House tearoom. After lunch, we go mistletoe planting on Apples in the recently established Downe Village community orchard. 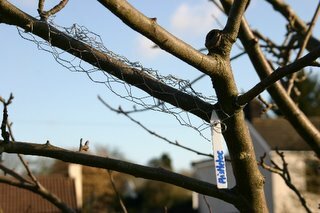 Every planting gets labelled, and some get a chicken-wire guard to deter seed-eating birds. Last site is at Downe Bank – a woodland/ grassland hillside site now managed by Kent Wildlife Trust. This is Darwin’s Orchis Bank – where he did his orchid studies in prep for the writing of Origin. 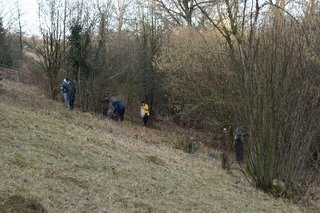 Here we plant on hawthorn, maple and whitebeam. The dominant tree is hazel, complete with dormouse boxes, but this isn’t a suitable host. An interesting site – still with many of the orchids Darwin knew here – though this is hard to appreciate in February! A good mistletoe day. Certainly Judy John (Bromley’s ‘Darwin at Downe’ World Heritage Site Officer) seems happy enough! 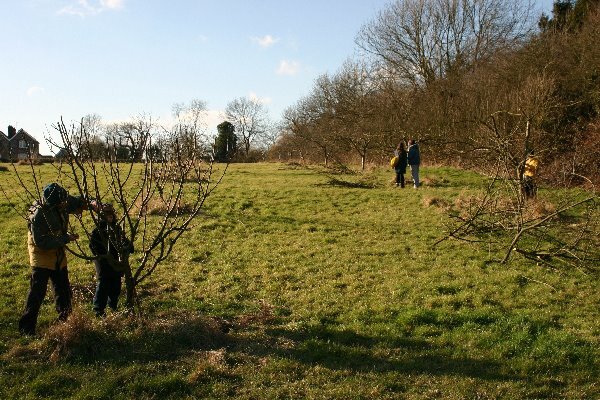 Thorpe Acre is now a suburb of Loughborough town, but was once an area of apple orchards – and mistletoe. 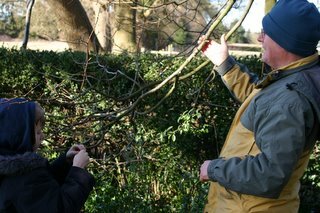 Recent initiatives by Roy Campsell and Mark Graham have shown that some of this mistletoe survives – on former orchard apple trees now ‘stranded’ in house gardens etc. So why not resuscitate the old mistletoe colony? 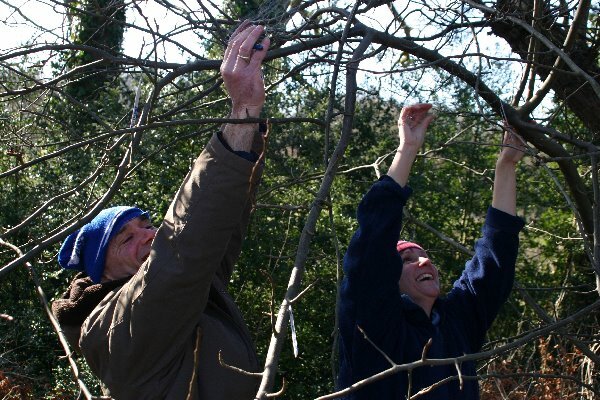 Collect berries from surviving mistletoe-infected trees and hand ’em out to the community to grow on on new trees. This is where I come in. Mark (wildlife officer with Charnwood Borough) has organised a berry exchange – at the Community Centre. 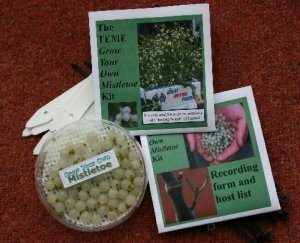 I give the background talk, and info (slides and handouts) on how to grow your own – and at the end of the evening local berrries are handed out to attendees. And it is very good session – lots of interest, loads of enthusiasm. 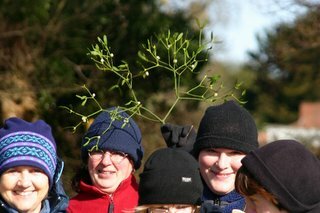 A proper mistletoe conservation event. It feels good. And Mark even provides fresh mistletoe tea to round it off. The annual Mistletoe Walk at Hampton Court Palace takes place this weekend, led by the Palace Estates Team and Tyrrell Marris, who heads up the Richmond Mistletoe Action Plan. Hampton Court has one of the best mistletoe colonies in London, known for at least 200 years, mostly in the Lime Avenues. 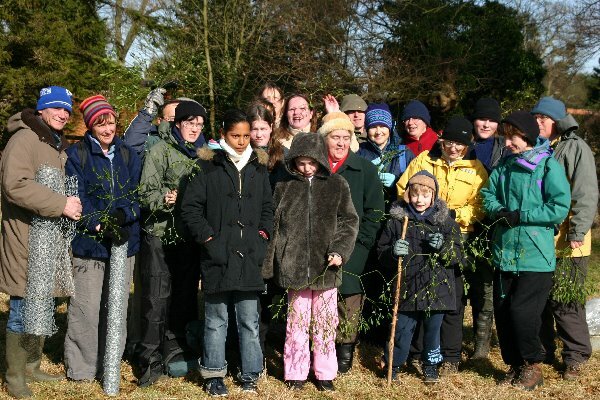 Saturday 18th February, meet at the Lion Gate entrance on Hampton Court road (opposite the entrance to Bushy Park) at 11.00am. As well as seeing the mistletoe there will be a special visit to the Palace’s 17th century Ice House. To Down House, Kent (actually London Borough of Bromley these days). This is Charles Darwin’s place, and I’m here with Judy John of Bromley Council and Toby Beasley of English Heritage to discuss planting mistletoe in the grounds and nearby. Down House and garden are owned by EH. The whole area has been proposed as a World Heritage Site – to be known as “Darwin at Downe” by the Government (Downe village has an E, Down House doesn’t). 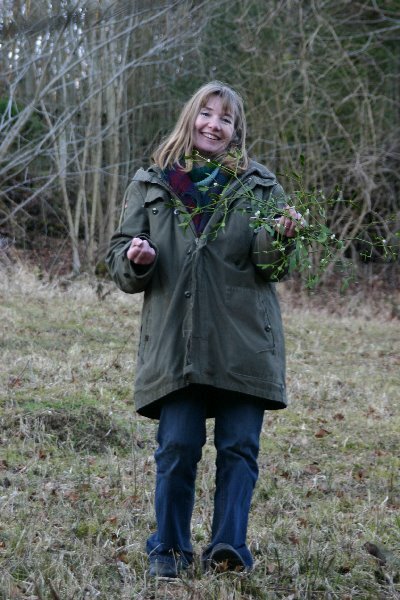 Judy is the Bromley’s WHS Project Officer and is promoting Darwin’s association with a range of nearby sites – the field where he undertook his famous earthworm studies, and the grassland bank where he investigated orchids etc. Darwin also studied mistletoe – and that’s where I come in. Today’s visit is just a recce – but a very satisfying one for me, as I’ve always been a Darwin fan. Later I have a quick trip into Hounslow- to suss out other potential mistletoe sites at Bedfont Lakes Country Park, just off the A30. A very different sort of site, but just as impressive in its own way. But more on this site another time…. The TEME mistletoe shop is back in buisness – but the Valentine Mistletoe isn’t moving very fast. That’s not really surprising – as there are a lot of valentine products out there and TEME haven’t really advertised. The exercise is more about seeing people’s reaction and feedback than making a profit (this year). And there’s not much time left for new orders now. 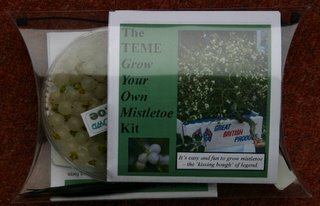 There is more interest in the TEME Grow-your-own Mistletoe Kit – and as this will be available for another 6 or 7 weeks there could be quite a run on these. The kit content was only finalised this week – with a colour ‘how to grow it’ leaflet compiled (by me) for inclusion. The whole package, pictured left, is shoe-horned into a plastic pillow-pack – originally conceived for the valentine’s gift but surprisingly suitable for the kit as well. Love that mistletoe! And those canals! Lots on the to-do list today, so have just spent a happy few hours ignoring it and browsing the web instead. 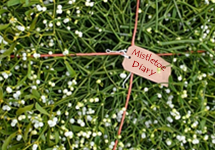 Amongst other distractions I ran a search on Mistletoe Diary – just to see whether there are many refs to it. The most prominent was at Granny Buttons, a “narrowboat blog about the English cut” by canal enthusiast Andrew Denny. This may seem an odd remark, bearing in mind my job is, er, restoring canals. Hmm… Actually there’s a long (and to me somewhat tedious) story, based on many examples, and the work and research of many people, stretching back years, behind that kind of remark and that concern. There are some very real issues, like them or not, but unfortunately these are very misunderstood, and often ignored (in a head-in-the-sand kind of way) by both the canal and wildlife lobbies. It can lead to conflict – often unnecessarily. Even when there are ‘show-stoppers’, a compromise of some sort can usually be reached – but of course one person’s compromise is another person’s sell-out…. I should know, sifting and forging ways forward through these issues has been my job for 20 years. It aint simple, and a lot depends on what one means by ‘restoring a canal’. But that’s all another story. If you really want to know more you could try reading my review of the issues in the Wildlife Trusts’ Wetland Restoration Manual – the Canals Chapter appeared in the second edition a few months ago – you can buy a copy by clicking here (though I think it’ll set you back £45 – extracts may be available on request…). Talking of canal restorations – we’ve got our money! For the first Phase of the Cotswold Canals project – 3 years of planning and prevaricating – and at last we have the budget – £11.9M from Heritage Lottery Fund, and £6M from South-West RDA – which with other commitments brings us a total of £22M towards the £24M needed. Digging will start in late summer – we hope… More on this at the British Waterways website. And if you’re really interested, take a look at our Project Atlas – detailing all the Cotswold Canal Phase 1 plans (including those for rare plants and bats) and open for comments now. Enough about canals! 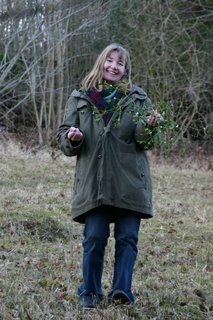 Back to Mistletoe Diary – and I see there are also refs in two organic gardening Blogs: Amy Stewart’s Dirt, and Andrew Skinner’s Lavendon Garden. Amy is in northern California – must drop her a line about mistletoe over there – there’s a long-established colony of European mistletoe in Sonoma County – just to the south of her, which I hope to visit later this year.